I make کوفته koofteh (kufteh) Iranian meatballs several times a year. Making koofeh is easy and delicious. These rice and beef meatballs are loaded with fresh aromatic herbs, stuffed with walnuts and raisins, simmered in a simple and tasty tomato sauce are an excellent main dish or a flavorful appetizer. Place the rice in a medium-size pot, add 2 cups of water, a tablespoon of oil and 1/2 teaspoon of salt, cover and cook 10-15 minutes or until the water is absorbed. Remove from heat, set aside. 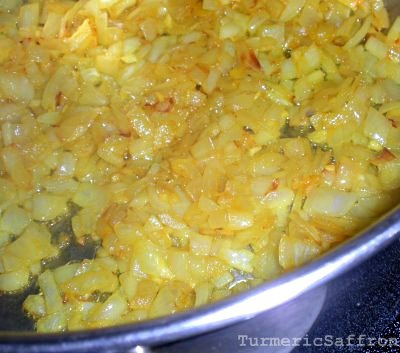 In a large pan saute onions in 3 tablespoons of oil until golden, add garlic and turmeric. Stir and saute for another couple of minutes. Pour both cans of tomato sauce into the pot, add 2-3 cups of water. add salt and pepper. Cover and simmer on low heat while you make the meat mixture. In a large bowl, add rice, ground beef, grated onion, eggs, chopped herbs, salt, pepper, turmeric, mix thoroughly. All the ingredients should be well distributed. Using a scoop take about 1/3 of a cup of the mixture, round it into a ball, poke a hole in it to stuff the fillings in, close the gap and one by one, slowly place into the gently boiling sauce. Place an upside down colander on the pot to let the steam out. Cook on medium to low heat for an hour. Adjust seasoning and add more water if needed. 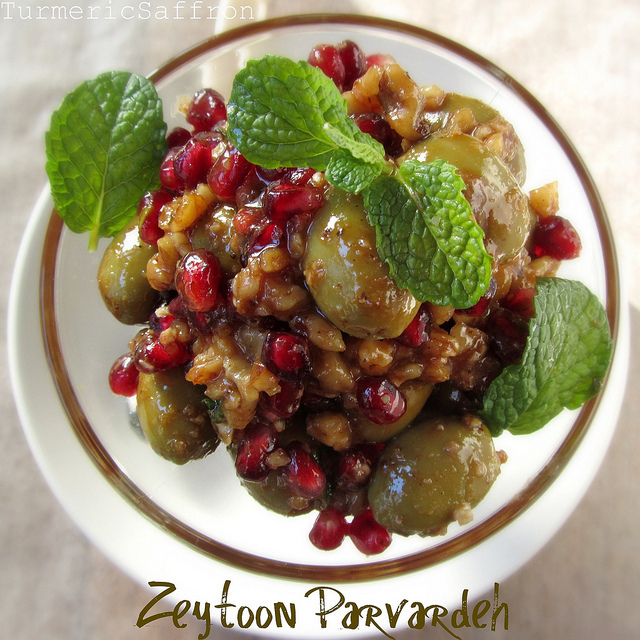 Serve with yogurt, pickles (torshi) and warm bread. 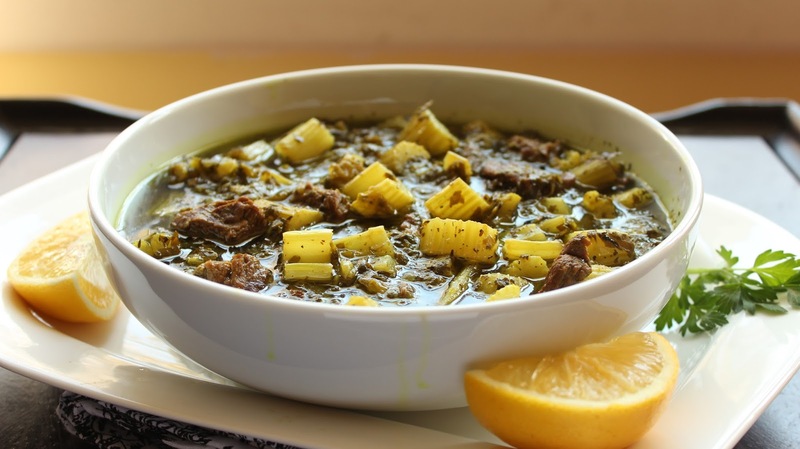 خورش کرفس Celery stew (Khoresh Karafs) is another healthy and delicious Iranian dish. It's a combination of meat, evenly sliced celery, finely chopped parsley, a little bit of mint (preferably fresh), fresh squeezed lime juice and the right amount of seasoning. 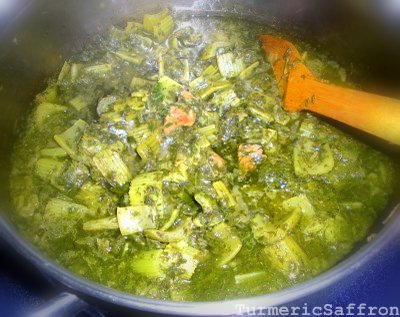 In my opinion, what makes Iranian food tasty, especially for most of the casseroles and stews (khoresh), is the slow cooking process and the taking time to let the food simmer in order to bring out the flavors and as we say in Iran, (ja biofteh). 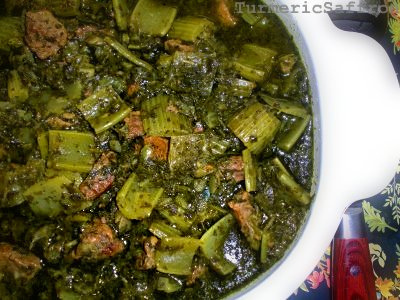 Khoresh-e karafs like ghormeh sabzi and fesenjoon will be fully cooked in 1 1/2 to 2 hours. However, it is better to cook them on the lowest heat setting for an additional hour at least. Most of us Iranians agree that the next day khoresh leftovers usually taste better. So, you may want to plan ahead for your next meal and cook them in advance. In a large pot, saute chopped onions in 3 tablespoons of vegetable oil over medium-high heat until they become light golden brown. Add the garlic and saute for an additional 2-3 minutes. Add the turmeric and the meat, stir and brown the meat on all sides. Add salt and pepper to taste. Then add 2-3 cups of water, bring to a boil, reduce the heat to medium-low, cover and cook. In a large frying pan, heat 2-3 tablespoons of oil over medium-high heat, saute celery until soft, add parsley and mint, stir well and saute for another 3-4 minutes. Add the sauteed vegetables to the pot, adjust the seasoning, add more water if needed, cover and continue cooking for another hour and a half or when the meat is fully cooked. Add the lime juice toward the end of cooking.